Work is that fixed time between sleep and when we’re free to do what we want. We need the work to provide for those latter times. It’s a job. Or so we think. A friend of mine says, “I’m going to ‘The Job'” as though that’s the name of the place. All work is magical because it turns something into something else. How many people can fix a broken leg, leaky faucet, wrinkled shirt, painful back, internet service and every other job we rely upon others? Work is never about money but is it not magical to transform something that was one way and make it another way? Just think of “Jack and the Beanstalk” and the laughter from his family when he proudly showed them three beans. Three silly beans in exchange for the family’s cow. Those beans soon become a tall, sturdy vine that reached the heavens in search of more magical items, i.e. the goose and the harp. Think of the fifth grade teacher who stands before 15-20 flubbering, fidgety brains in the hopes of transmitting one ounce of biology, English or critical thinking into anxious growing minds. And somehow, doesn’t it work again and again? If that isn’t magical then what is? We see towering buildings being built and take for granted that someone knew what he/she is doing. We drive on their highways hoping that their calculations and measurements were, at least, kinda close. We’re stopped by law-keepers wishing they missed our traffic mistake and instead want to wish us a happy day. Nice try on our part but also transforming. A nurse smiles and squeezes the patient’s shoulder and leaves the room filling that room with hours of contentment. We take it for granted. “We’re just doing our job,” we say and then return home to rest, recreate and repeat “The Job” again tomorrow. Work works for us until we retire. Some count those retiring days until they need to do magic no more. Sorry for them when magic continues in retirement. Work sounds so like so much effort, routine; hence boredom. The word magic has the unknown affixed to it (just try fixing your own toilet! I tried and was glad 24-hour service was available but make sure you have enough cash on hand!). It’s a feat which only magicians (I mean plumbers) can achieve. Each of us produces so much. So much more than we can measure. It’s the magic of work because work is never about working but it’s about working the magic. Keeping collecting those “three beans.” They’re magical. 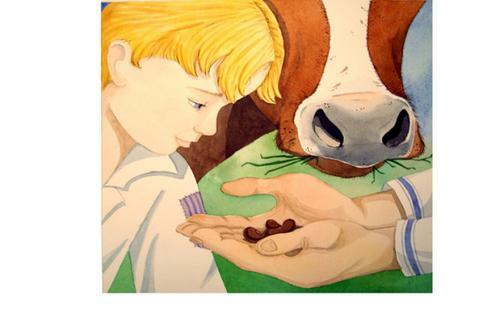 This entry was posted in Spirituality and tagged Jack & Beanstalk, magic, magic beans, Work. Bookmark the permalink.